Volume 4, Edition 46 Trouble loading? View this email online. 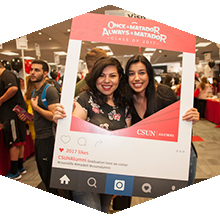 Classes, friends and certain campus critters are some of the reasons why CSUN is #MyTopCollege, thanks to Matadors posting on social media. Help CSUN move into the top five by posting to Twitter @csunorthridge or Instagram @csun_edu while tagging our handle and #MyTopCollege. 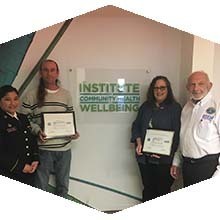 U.S. Department of Defense officials presented sociology professor David Boyns and Associate Vice President of Academic Resources and Planning Diane Stephens with the Patriot Award for their support of Danielle de Asis, a CSUN employee who serves with the U.S. Army National Guard. Thur, July 13, 7:30 p.m.
Go for a journey on the high seas with the CSUN community during the latest showing of the AS Summer Movie Fest, Disney’s Moana. Head to the Oviatt Lawn early for the best seats! Sat, July 15, 9 a.m. Receive hands-on training that will prepare you for a variety of cardiac, breathing and first aid emergencies. For just $50 per person, you can learn the tools to save someone’s life. This training will be held at the USU, Thousand Oaks Room. Guarantee yourself a great seat for upcoming VPAC shows by ordering your tickets today. CSUN faculty and staff came together to celebrate the completion of the 2016-17 academic year with an evening of food, games and mingling at the Student Recreation Center. Coming off the program’s first regular-season Big West title, CSUN will host 10 games at Matador Soccer Field, starting on Aug. 20 against Pacific University. The reigning Big West Conference Tournament and South Division Champion Matadors will kick off the 2017 season hosting Siena University on Aug. 25. According to a report by CSUN business law professor Melanie Stallings Williams, U.S. potato-grower cooperatives in the early 2000s colluded to reduce the amount of potatoes grown across the country in an effort to increase profits.